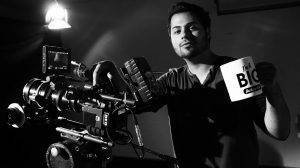 Yuri Alves is a writer – director with a distinctive style and sensibility to cinema. Alves was born in Rio de Janeiro to Portuguese parents and raised in Newark, New Jersey. His 2011 short film, “Broken Clouds”, earned a loyal following and earned numerous awards worldwide. In 2012, Alves directed two critically acclaimed episodes of “Tempo Final”, a primetime TV series in Europe. Alves was Head of Production at Fox Digital Studios in Los Angeles from 2012-14, and has directed television and commercials for production companies and agencies in the US and Europe. His critically acclaimed short film, “Exit Road”, was an official selection at festivals worldwide including the renowned Raindance Film Festival where both “Memento” and “Oldboy” both premiered. Yuri is currently developing 2 feature length narrative fiction projects including a feature length documentary. Entrada livre mediante inscrição prévia. Destina-se a todos os interessados em realização.